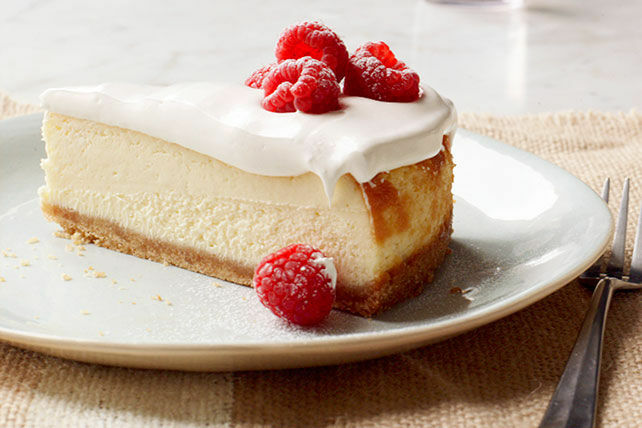 This creamy cheesecake boasts a crushed wafer crust and a layer of sweetened cream cheese and whipped topping. Combine wafer crumbs and butter; press onto bottom of 9-inch springform pan. Beat 3 pkg. cream cheese, 3/4 cup sugar and 1 tsp. vanilla extract in large bowl with mixer until blended. Use sharp knife to gently split vanilla bean pod lengthwise in half, then scrape seeds into cheesecake batter. Add eggs, 1 at a time, mixing on low speed after each just until blended. Pour over crust. Bake 50 to 55 min. or until centre is almost set. Run knife around rim of pan to loosen cake; cool before removing rim. Beat remaining cream cheese, sugar and vanilla extract with mixer in large bowl until blended. Whisk in Cool Whip; spread over cheesecake. Refrigerate 4 hours. Substitute foil-lined 13x9-inch pan for the springform pan. Mix crust ingredients as directed, using 55 vanilla wafers (crushed to make about 2 cups crumbs) and 1/4 cup butter. Press onto bottom of prepared pan; cover with prepared filling. Bake 45 min. or until centre is almost set. Cool completely in pan. Spread with Cool Whip mixture. Refrigerate 4 hours. Use ends of foil to remove cheesecake from pan before cutting to serve. Use bottom of dry measuring cup to press crumb mixture onto bottom of pan. Prepare recipe as directed, omitting the vanilla bean and using 1 Tbsp. (3 tsp.) vanilla extract. Add 2 tsp. vanilla extract to cheesecake batter and 1 tsp. vanilla extract to flavour cheesecake topping as directed.